A well-argued study by one of the left’s more subtle and nonsectarian thinkers (The Death and Birth of American Radicalism, not reviewed, etc.). 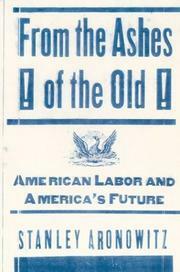 Aronowitz (Sociology/City University of New York) makes his viewpoint clear early in the work when he states that “the labor movement remains the best hope for democracy.” This makes of his book more an analysis of the political present and future of America than merely a narrow study of unions. He contends that a reinvigorated labor movement would have the potential to counteract the (in his view) hegemonic power of corporations in the US and the unresponsiveness of government to the needs of most people. He is not naive, however; he points out that union membership has dropped from over 40 percent of the private labor force in the late 1940s to under 10 percent today. Still, he sees hopeful signs as well: the successful 1997 UPS strike, the emergence of an activist leadership in the AFL-CIO. But labor must do much if it is to claim a place of leadership. It must break free from its dependence on the Democratic party and the liberal state, and stake out its own political space and ideology. It must be more adversarial and less accommodating to corporate power. It must move beyond the narrow confines of a shrinking industrial base and recruit membership from four crucial sectors: the South, the working poor, professional and technical employees, and low-paid white-collar workers. It must align itself with other progressive social movements. Finally, it must present a vision of America that inspires, that challenges the dominant mood of atomistic individualism and fatalism in which, he says in a nice turn of phrase, “the lotto winner is everyman.” Aronowitz handles all of this with his usual intellectual acuity and fluid writing. Aronowitz goes against the grain of much recent thinking. If for no other reason, this is a book to read and consider.